With the narrow victory, Tottenham maintained its strong position at the third spot in the Premier League table with 60 points from 26 games. The Spurs are just 5 points adrift from table leaders Liverpool and only three points apart from second-placed Manchester City. Tottenham registered a fantastic 3-1 victory over a sorry Leicester City side on Sunday at Wembley Stadium. It was a scintillating Premier League encounter where the Foxes missed a string of clear-cut chances, including a penalty, while some clinical finishing from the Spurs made all the difference in the match. Davinson Sanchez, Christian Eriksen and Son Heung-min were the scorers for the home side while the only consolation for Leicester came from Jamie Vardy. Tottenham started the match on a positive note controlling possession in the middle of the park and snuffing out the danger posed by Leicester City attackers. Despite a strong showing, the Spurs were clearly missing a clinical touch in front of the goal with second-choice striker Fernando Llorente spearheading the home side’s attack. 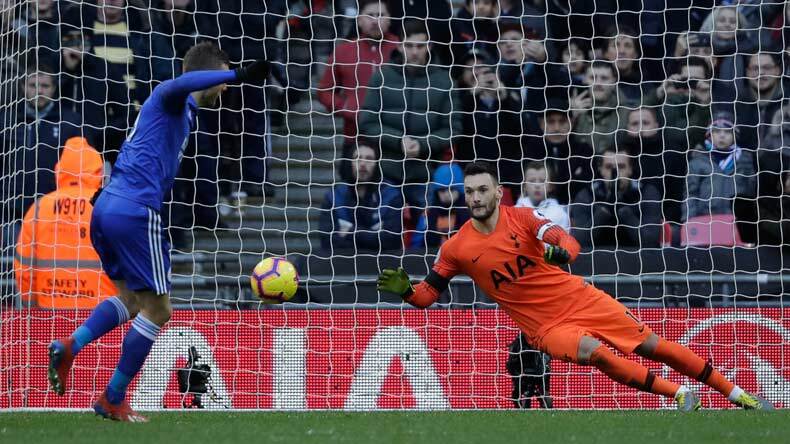 On the other hand, Leicester defended resolutely and threatened Tottenham on the counter attacks, however, in the 33rd minute of the match, the Foxes’ defence was exposed as Christian Eriksen chipped in a beautiful cross into the box which Davinson Sanchez sublimely headed into the net. Leicester City had missed a couple of clear-cut chances in the first half and then the travelling side topped their blunders in the match when Jamie Vardy missed a penalty shot in the 60th minute. Three minutes later, Eriksen stomped his authority in the match yet again when he curled in a superb shot into the net from outside the box making it 2-0 for Mauricio Pochettino’s men. Tottenham Hotspur midfielder Christian Eriksen is teed up on the edge of the box by Fernando Llorente and the Dane takes a touch before smashing it into the corner of the net to double Spurs’ lead. However, Jami Vardy got his side back into the game when he displayed his supreme poacher skills and tapped in a drilled cross. The visiting side then grew in confidence and began a barrage at the Spurs’ defence, Vardy came close to equalising score in the 80th minute but agonisingly missed the chance from close distance. Man-in-form Son Heung-min put the final nail in Leicester’s coffin after he ran the entire field on a counter attack and gave a sublime finish past Kasper Schmeichel to make it 3-1.